What do you Think of Men’s Engagement Rings (Mangagement Rings)? Home » deBebians Fine Jewelry Blog » What do you Think of Men’s Engagement Rings (Mangagement Rings)? When you observe that a man is wearing a ring on his left hand, it might not necessarily mean that he is married these days. In fact, he may be sporting a ring that is part of the growing trend, called a ‘mangagement ring’ or a men’s engagement ring. Have you heard of this trend? More and more men (as well as their partners) want the world to know that the future groom is off limits also during the engagement period as well. However new this concept may seem to Americans, this growing trend in the United States was already a common practice across the world. Some men prefer wearing a plain ring on their right had as their engagement ring, while others prefer the look of gold signet rings. 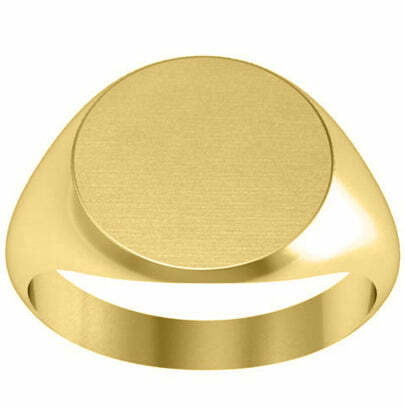 The classic look of mens signet rings makes them great engagement rings for men as well as accessories. These rings can be worn in on the right hand after the wedding band takes its place. deBebians also offers a wide variety of men’s diamond rings that would be lovely! Let us know what you think of this trend in the comments section of this post.